It is award season again. Just a week or so ago we had the Emmy Awards, and now Sister Alice Gray just got herself an Oscar. No, a gold-plated statuette didn’t go with it, but it was an Oscar just the same. 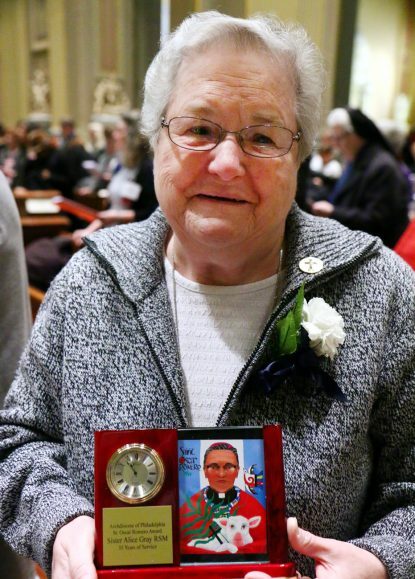 To be precise it was the St. Oscar Romero Award, given for the first time at the Archdiocese of Philadelphia’s annual Mass for Religious Education, to be celebrated this year on Saturday, Jan. 12 at the Cathedral Basilica of SS. Peter and Paul with Bishop Michael Fitzgerald presiding. Sister Alice, a member of the Religious Sisters of Mercy for the past 50 years, was honored for 35 years as a parish Director of Religious Education, mostly at St. Dorothy Parish in Drexel Hill. Growing up in Holy Name of Jesus Parish in the Fishtown section of Philadelphia and continuing her education at John W. Hallahan High School, the fifth of six children of Thomas and Elizabeth Gray, it was not her intention to enter religious life. As a teen and a young adult she just assumed that someday she would be a wife and mother. She went to the dances and proms, she dated and hung out with her friends from the neighborhood. There was a teacher shortage in the early 1960s and straight out of high school Sister Alice was hired as a lay teacher for first grade at Most Precious Blood School in North Philadelphia while taking college courses toward a degree at Holy Family College. She enjoyed teaching but somehow it wasn’t enough. She knew there was more to life than taking home a check, even a small one. After a few years she sensed God was calling her to serve his people full time as a vowed religious. Father William Finley at Most Precious Blood was especially helpful in guidance as she considered various religious congregations. Sister Alice was familiar with the Immaculate Heart Sisters from Holy Name, St. Joseph Sisters from Most Precious Blood and various congregations at Hallahan. They all had a great influence on her. Through Father Finley she was introduced to the Religious Sisters of Mercy who conducted St. Katherine Day School where he was chaplain, and that was the best fit. “Yes, my family was surprised when I told them,” she conceded. That was in 1968, and she was in for a surprise herself. “I entered with a band of 23 of us,” Sister Alice remembers, and at 23 she was the oldest because she did not enter straight out of high school which was the norm then. “I hadn’t thought about living with so many people, and it took a bit of getting used to,” she said. However, she persevered, always keeping in sight her goal of serving the Lord. Meanwhile, she finished her degree studies at Gwynedd Mercy College. As an elementary school teacher Sister Alice taught lower grades at St. Paul, Allentown; Merion Mercy Academy and St. Raymond of Penafort, Philadelphia. This was followed by DRE at her former parish, Most Precious Blood Parish, thanks to a St. Martin de Porres Foundation grant. After the parish closed in 1993, she became DRE at St. Dorothy, Drexel Hill, where she remains to this day. At least back in her early days as a DRE, Sister Alice found the kids in CCD were often treated as second-class citizens. They were at the back of the line when receiving the sacraments of first holy Communion or confirmation, and also for the May procession. At St. Dorothy there are 253 children registered kindergarten to eighth grade in the Parish Religious Education Program, or PREP. “At registration we tell the parents (about special needs) and a fair number do stay the whole time through eighth grade,” Sister Alice said. “I have 19 catechists and 18 assistants and half a dozen teenagers working with them. They are a great asset; all of our volunteers are generous with their time. As a DRE, Sister Alice has much more contact with the families than she did as a classroom teacher. She also works as a catechist with adults through the parish’s RCIA, Bible study and adult education programs. “It’s a blessing. I can support the whole family,” she said. “I loved teaching the children in the schools, but I felt I could do more by also teaching the parents.